Beetles comprise forty percent of the insect kingdom, and come in a wide variety of shapes, colors and sizes. In general, all have hard, opaque wing covers that meet in a straight line down the middle of their backs, a characteristic that gives them an armored appearance. Numerous species of beetles inflict damage to flowers and garden crops, both in their larval and adult stages. They do this by eating leaves, stalks and flowers, and sometimes plant roots. Their snout-nosed cousins, weevils and curculios, primarily inflict damage by boring into stems, flower buds and fruit; for more information on these pests, see Weevils and Curculios - Seed and Fruit borers. An exception is the carrot weevil, which is treated in this section under Specific recommendations for vegetables, below. Light beetle infestations can be controlled by handpicking; heavier infestations will require you to handpick up to 2 or 3 times a day. Afterwards, either crush them or drop them in a pail of soapy water. As a last resort, apply a spray of pyrethrum and isopropyl alcohol, mixed at the rate of one tablespoon of alcohol per pint of diluted pyrethrum mixture. Apply this solution every 3 to 5 days for 2 weeks, or until the problem is corrected. To prevent future problems, cultivate your garden soil late in the fall and again in the spring to expose beetle eggs, larvae and pupae to the weather and to predatory birds. For long-term control, spread milky spore disease (Bacillus popilliae) over lawns and gardens, remembering that it will take a few years before this method will prove completely effective. Specific recommendations for flowers. The following beetles are a particular nuisance to the flower gardener. 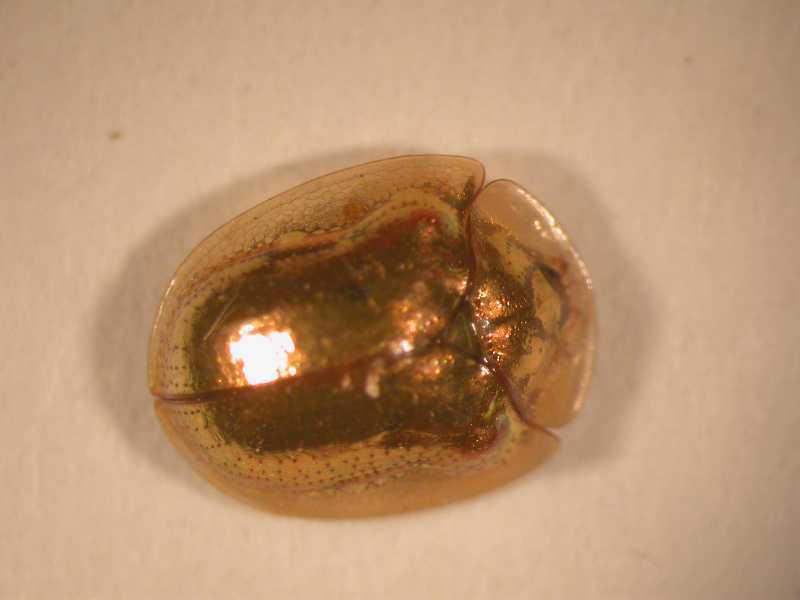 Asiatic garden beetles are nocturnal beetles, resembling Japanese beetles except that the former are cinnamon brown all over. Adults can skeletonize leaves and flowers of ornamentals such as annual aster, chrysanthemum, cosmos, delphinium, perennial aster, petunia, phlox and zinnia. Black blister beetles are long and slender with soft, flexible wing covers, sometimes marked with white stripes or margins. 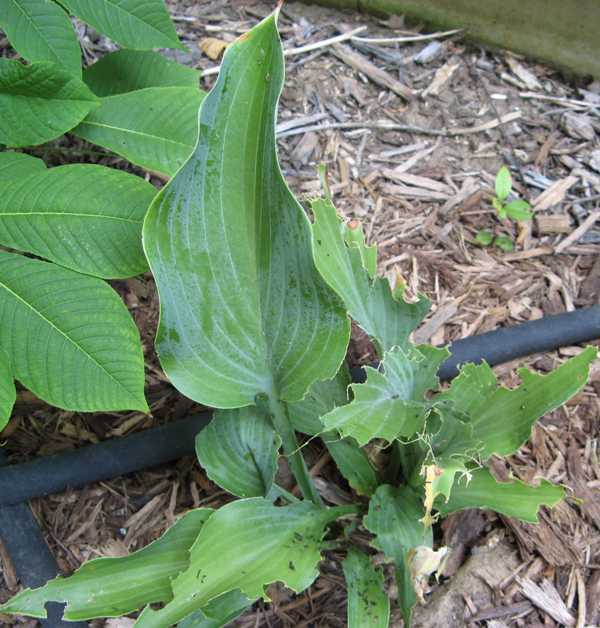 The adult chews the foliage of popular flowering plants like annual aster, chrysanthemum, phlox and zinnia. Gloves should be worn when handling this pest, which derives its name from its ability to cause blisters to exposed skin when crushed. 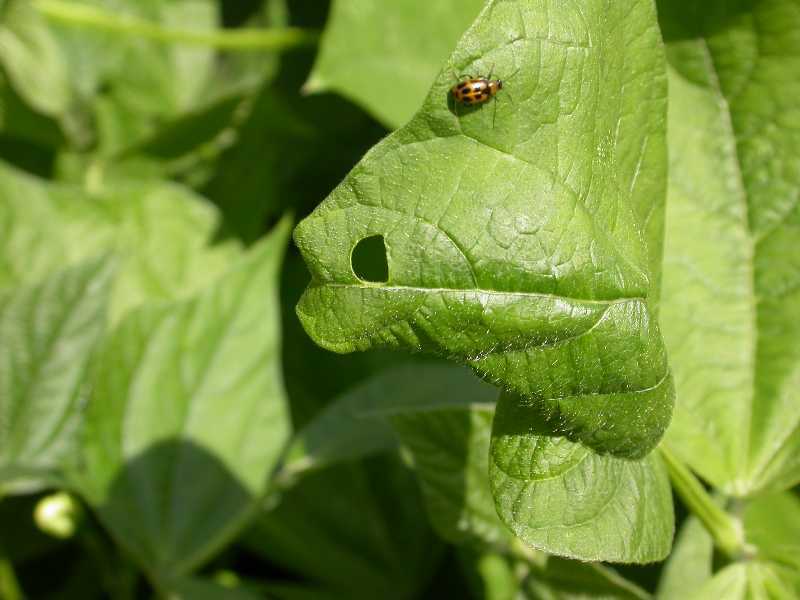 Tiny, jumping flea beetles can chew lots of tiny holes in ornamentals such as annual aster, forget-me-not, nasturtium, petunia and phlox. 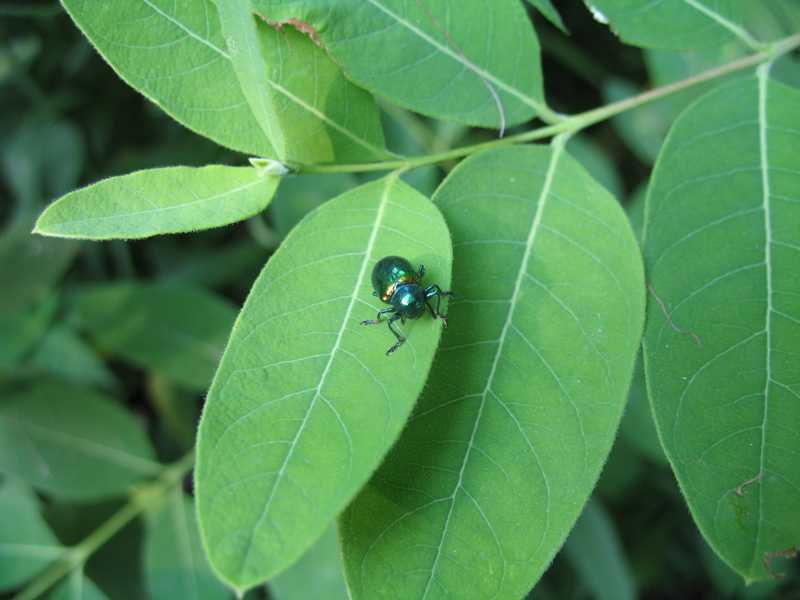 Shiny, metallic green and copper-colored Japanese beetles can skeletonize the leaves and flowers of popular flowering plants like annual aster, astilbe, canna, cosmos, daylily, delphinium, four-o'clock, hollyhock, iris, marigold, peony, perennial aster, rose and zinnia. Tan-colored, long-legged rose chafers, also known as rose bugs or rose beetles, chew on the flowers of chrysanthemum, hollyhock, peony, poppy, and roses. All of the above beetles as well as their destructive grubs can be controlled by methods listed under General recommendations, above; additional methods for some of these species are listed below under Specific recommendations for vegetables. Specific recommendations for vegetables: A number of beetles can wreak havoc with your garden crops. Some well-known pests will be described separately below. While methods for controlling them are basically the same as those listed under General recommendations, exceptions will be duly noted. 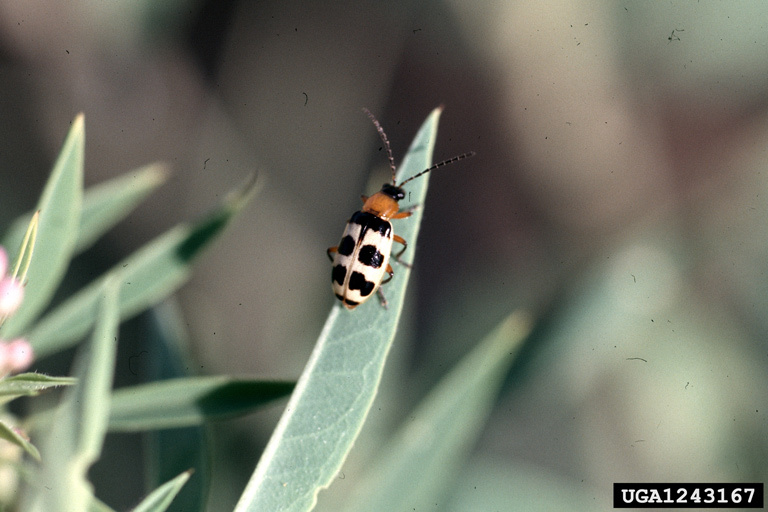 The asparagus beetle is blue-black with four white spots and reddish margins. The larva is a greenish gray hump-backed grub with a dark head. It can defoliate mature asparagus plants and leave young spears misshapen. The larva of the carrot weevil chews zigzag tunnels into the tops and roots of carrots, celery, parsley and parsnips, destroying most of the plant tissue. 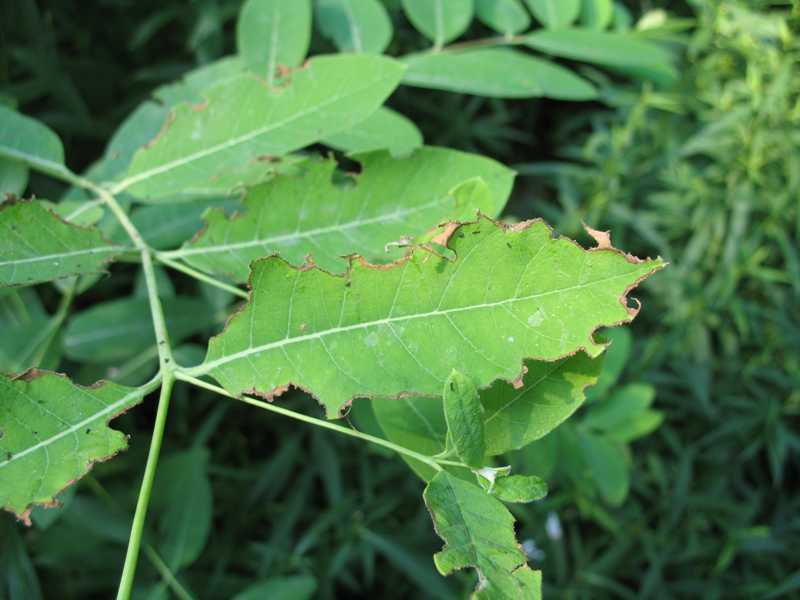 Prevent infestation with juvenile stage nematodes, or by using netting or other barriers to keep adults out of target crops throughout the season. Apply sabadilla dust to control infestations already underway. 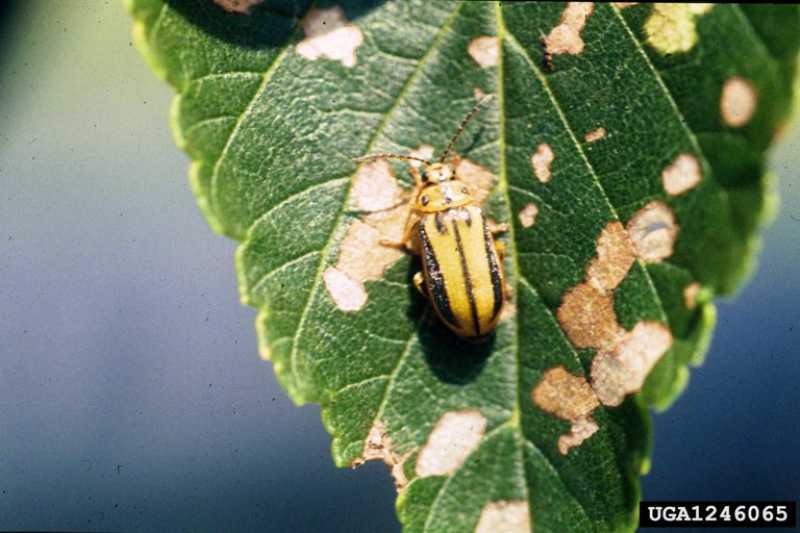 The Colorado potato beetle is yellow with black stripes and an orange head covering. The larva is a plump red grub with black spots and a black head. Both can defoliate and skeletonize the leaves of eggplants, potatoes and tomatoes. 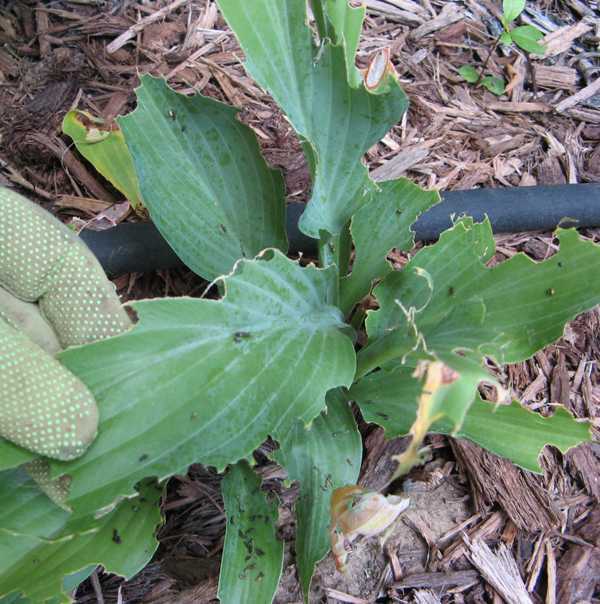 In addition to the general control methods listed above, application of a heavy organic mulch around vulnerable plants may prevent emergence of beetles from the soil. 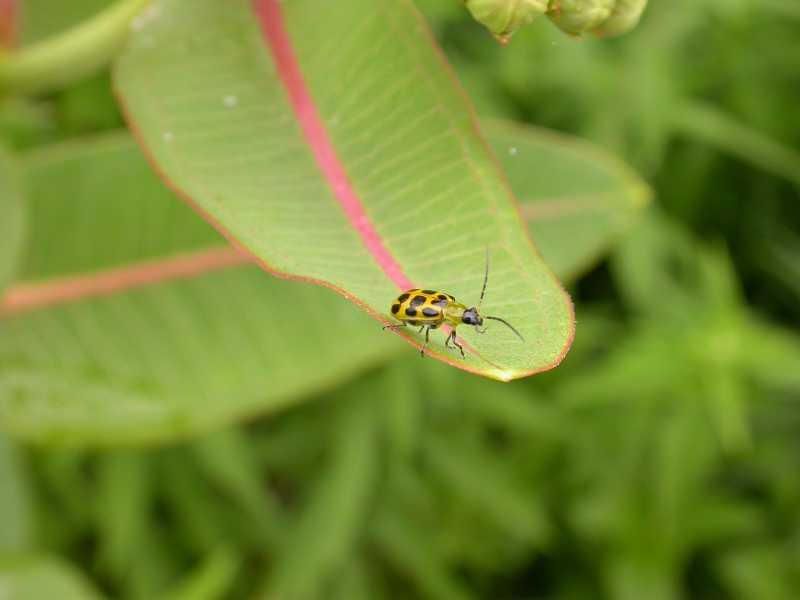 The cucumber beetle is oblong and yellow with either black stripes or spots; of the two, the former variety is the most destructive. 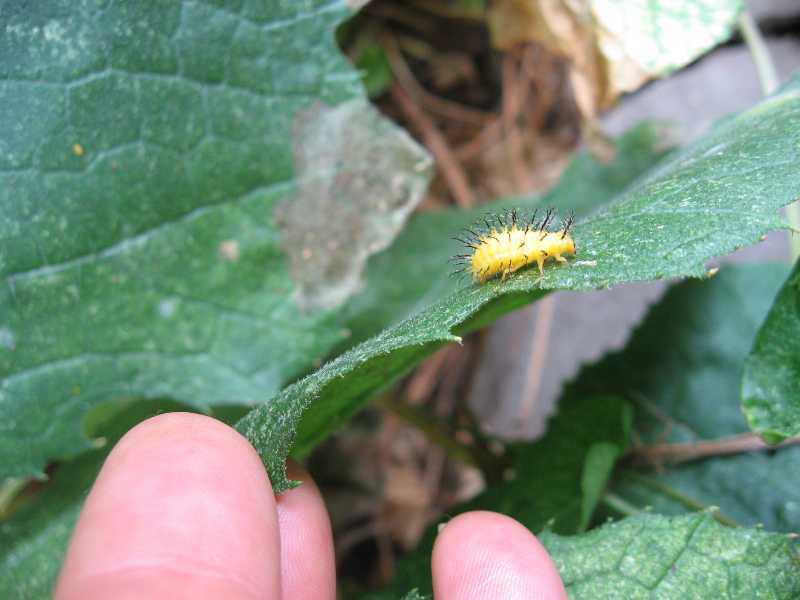 The whitish larva can be found near the base of a number of vulnerable plants including asparagus, early beans (lima and snap), corn, cucumbers, eggplants, muskmelons, peas, potatoes, pumpkins, squash (summer and winter), tomatoes and watermelons. While this beetle will directly inflict only minor damage to crops, it has the potential to inflict much more serious damage through the spread of diseases such as cucumber wilt, cucumber mosaic virus, or bacterial wilt. 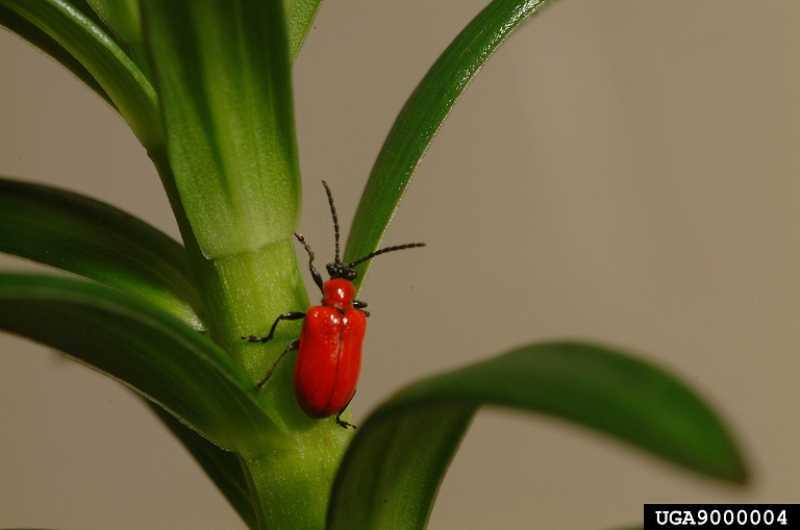 For this reason, it is important to prevent these beetles from feeding on vulnerable plants, particularly through the period between germination and flowering. Use some sort of agricultural fleece to keep beetles from laying eggs near the base of plants. 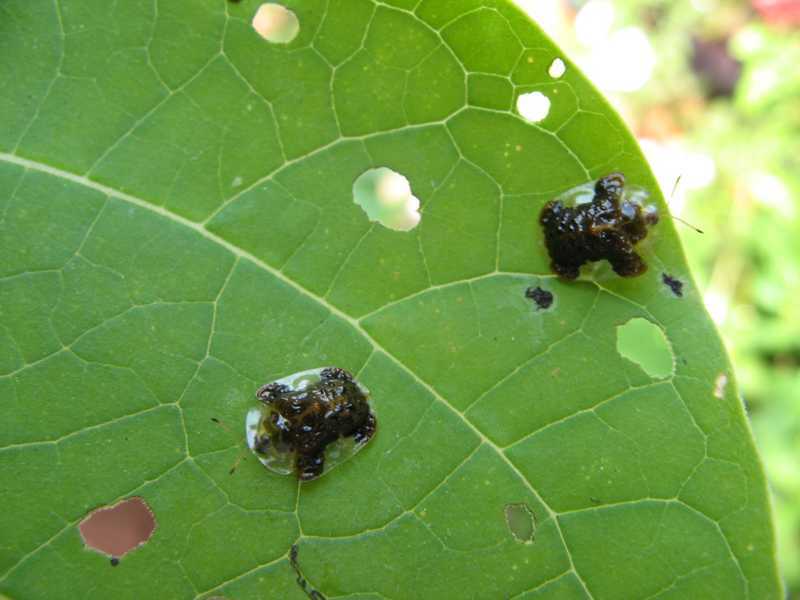 The tiny, jumping flea beetle is another common crop pest that chews lots of tiny holes in the foliage of a wide variety of crops, including beans (lima and snap), beets, broccoli, brussel sprouts, cabbage, cauliflower, chard, Chinese cabbage, collards, corn, eggplants, kohlrabi, muskmelons, peppers, potatoes, radishes, rutabagas, spinach, tomatoes, turnips and watermelons. In addition to their ability to destroy small plants rapidly with their feeding, flea beetles can harm crops through the transmission of viral and bacterial diseases and bacterial wilt. 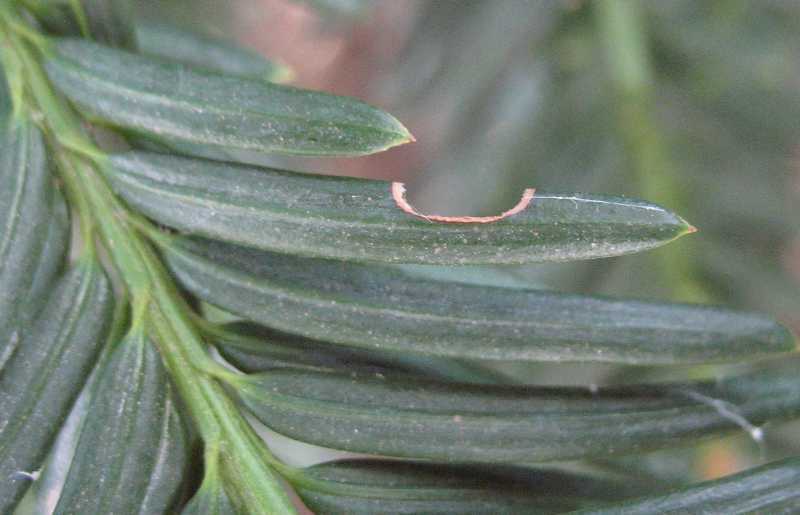 Furthermore, their larvae can damage plant roots, thereby weakening plants. In spring, prevent access to target plants through the use of barriers such as agricultural fleece. Control infestations with pyrethrum. 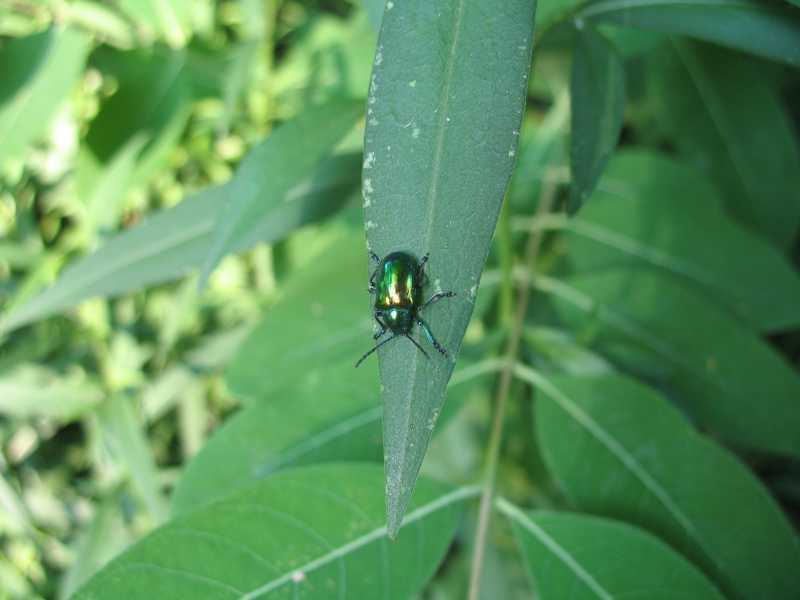 Japanese beetles are easily distinguished by their shiny, metallic green bodies and copper-brown wings. The equally destructive grub is grayish white with a dark brown head. The adult feeds primarily on leaf tissue between the veins, leaving the foliage and flowers of infested plants skeletonized. Its favored foods include asparagus, beans (lima and snap), okra, peaches, raspberries, rhubarb, and leaves and silks of sweet corn. The grub chews on plant roots, and is particularly fond of those pertaining to lawn grasses, beans, sweet corn and tomatoes; it also may nibble on onions or potatoes. 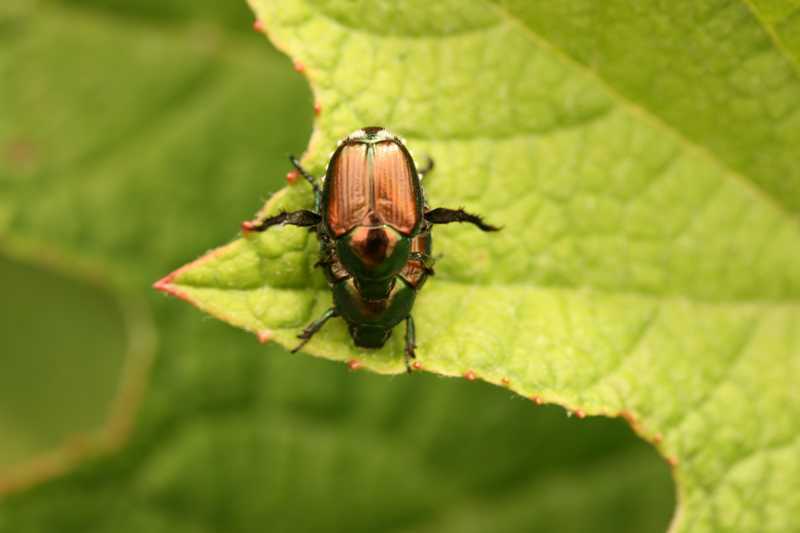 The best control for the beetle is to set up commercially available pheromone traps a week before expected emergence in your area; make sure that traps are no closer than 50 feet from vulnerable crops and are hung 5 feet off the ground. Handpick any stragglers, or use pyrethrum if traps cannot handle the infestation. Control grubs with juvenile stage nematodes or with milky spore (Bacillus popilliae), bearing in mind that the latter control will take a few years to be fully effective. The Mexican bean beetle resembles the lady bug, and is small, round and copper colored with 16 black dots in three rows down its back. 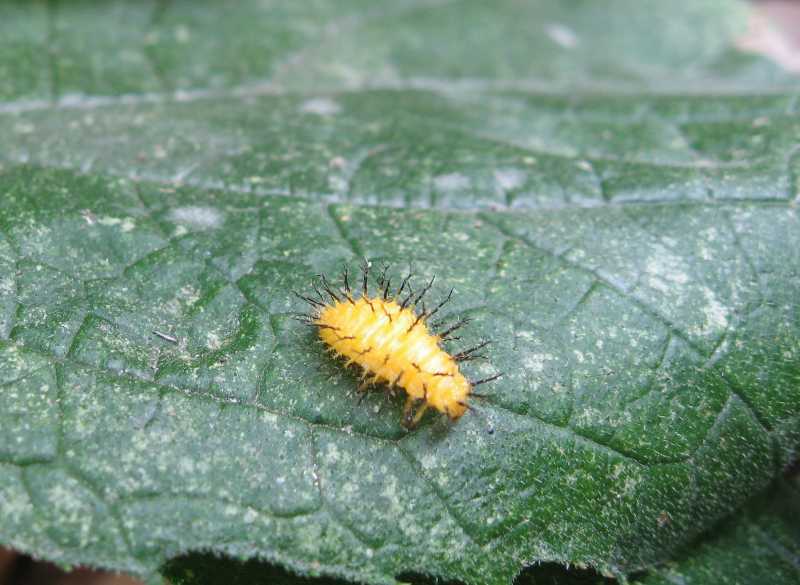 Its larva is orange or yellow, hump-backed and fuzzy. 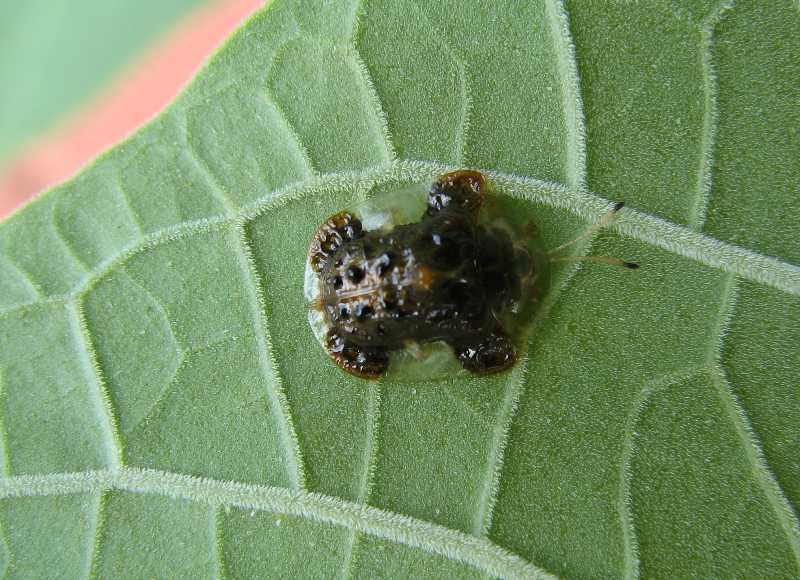 Both feed on lower surfaces of foliage, skeletonizing leaves. 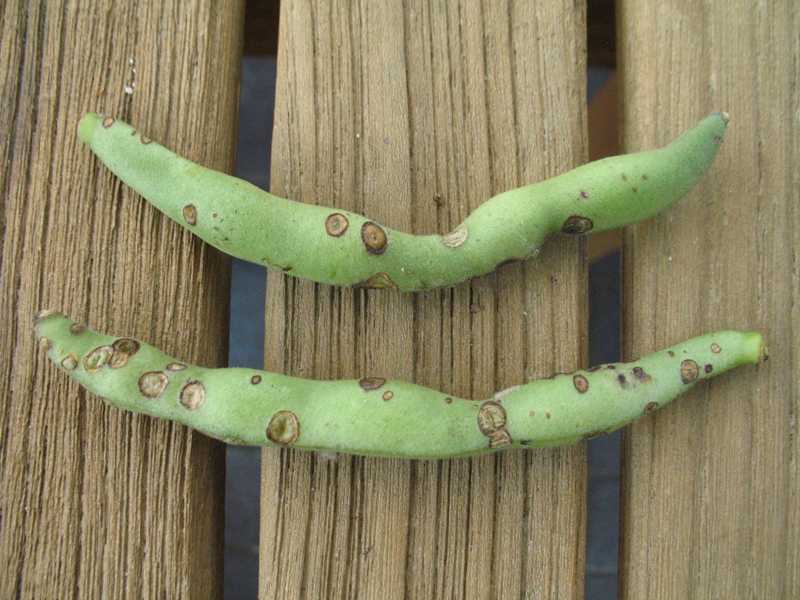 When abundant, they may also feed on bean pods and stems. In addition to bean crops (lima and snap), summer and winter squash may be affected. 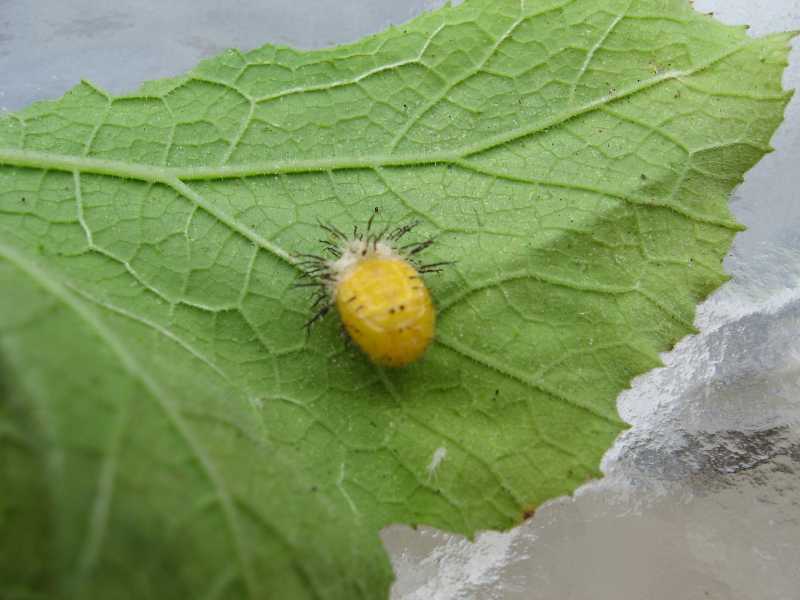 To control this pest, handpick early arrivals, paying special attention to the easy-to-spot bright yellow eggs laid in groups of 40 to 60 on the undersides of bean and squash leaves. Use pyrethrum for an infestation that is out of control. 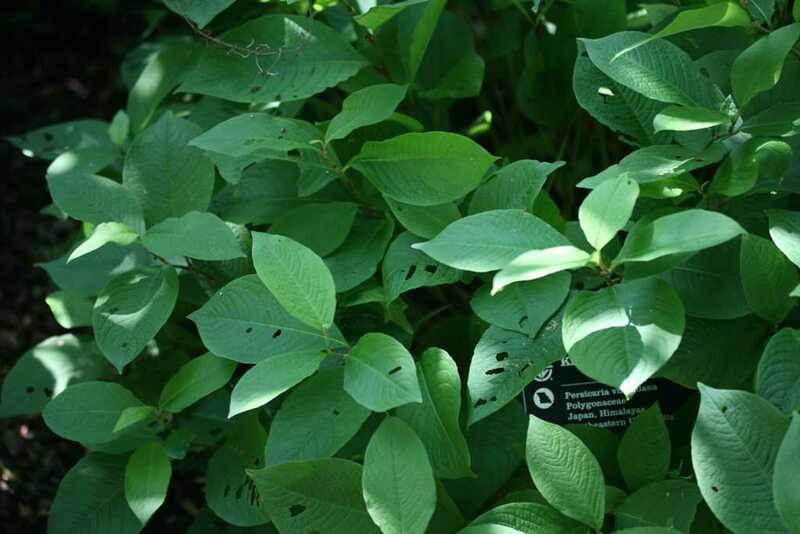 The edges of these Indian hemp leaves (Apocynum) were eaten by the dogbane beetle (Coleoptera).